Northern shared this picture showing the aftermath of the landslip. Rail services between Halifax and Hebden Bridge have resumed this morning after trees were swept onto the railway line during a landslip. Northern had to suspend services between the two West Yorkshire stations yesterday, creating severe disruption for passengers. It said "exceptional weather" in the Mytholmroyd and Sowerby Bridge area had caused a landslip and a number of trees had fallen onto the line. 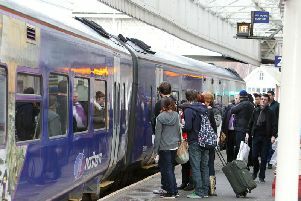 Services between Leeds and Manchester Victoria and York and Blackpool North were among those affected, with rail replacement buses put in place. Transport chiefs at Metro had said that the line was expected to be closed for the next few days. But Network Rail announced that it had reopened shortly before 4am today. It said engineers would remain on site and there might still be some delays.